It’s both good and bad news. I’ll leave the bad news up to you, but the good news is there is still time to make some summer break plans to learn, to do and to read. Have you made your list of things to learn, to do and to read yet? Skype – – I have used it and am LOVING IT! It feels nothing short of a miracle every time it works. My dad asked me a “technical” question about how Skype works the other day on a video chat and my answer was “It’s magic!” and that pretty much sums up how I feel about the whole thing. I totally wish I would have started using it earlier. Hootsuite – I’ll just say there is still time in the summer for me to give it a go. Movie Maker – I’ve been playing around with camera placement, lighting and getting ideas together. Look for some new videos from me in the next few months. Student Motivation – I am so excited to be learning about the research behind motivation. More on that below. Yoga class twice a week at It’s All Yoga – a work in progress! I’m going to class more than I have been in the last couple months, but not making that twice a week goal. Something to work on. Daily restorative yoga – dude. I need to get on this one. Manicure – Must schedule appointment. Pedicure – Must schedule appointment. Is this a good time to talk about my fear of getting oglies from getting a pedicure? Because I really think that is what is holding me back. Foot massage -Someone may need to hold my hand on this one. 90 Minute full body massage July AND August appointments are on the books. Road trip to see Rhett Miller with friends. Show tickets are purchased. Now we need to rent a car and find good places to sleep. I may also try to convince my friend to go to a restorative yoga class in SF. Ride my bike for errands. – Dude, where’s my bike? Nap in a hammock.- The hammock has been put together and has clocked lots of reading hours. The cat and the kid fight over who gets to try to knock me off. Needless to say, I may have to switch this from napping to reading. Just for safety if nothing else. Make pie. Good god, I love pie. – So many pies have been made and consumed this summer. Visit Bay Area grandparents – DONE several times! Visit Mendo County grandparents – in the scheduling process. Visit Portland friends – they are coming here instead of me going there. Two on the books. Visit the swimming pool several times a week as a family – Best.Idea.Ever. We’ve been meeting another family there for dinner and swimming more nights and it is simply the best. I’m going to be sad when summer ends. Ride bikes as a family. – I am not even sure where my bike is at this point. Go to the farmer’s market together. – So far it’s been teams of two, not three, but we go several times a week. Cook outside at the pool and eat dinner there. – We haven’t cooked there, but we’ve brought lots of picnic food with us. I love summer food! Especially when it is shared with good friends. Complete the summer reading program at the library. Just Kids by Patti Smith – It was so different than what I thought it was going to be I have to say I was just surprised. I liked it, not loved it. I learned a lot, but completely different stuff than I had anticipated. Mindful Teaching and Teaching Mindfulness – I have it, but haven’t started it yet. Steal Like An Artist – by Austin Kleon. I reviewed it here. Uncertainty by Jonathan Fields – I have it, but haven’t started it yet. Mindset by Carol Dweck – I’m almost finished with it and if I have seen you in person recently I’ve told you to read it. Can’t wait to tell you more about it. Harry Potter and the Order of the Phoenix – I’m on page 556 and I’m still in, so it must be good. That’s my mid summer update! How are you making the most of what’s left of summer break? 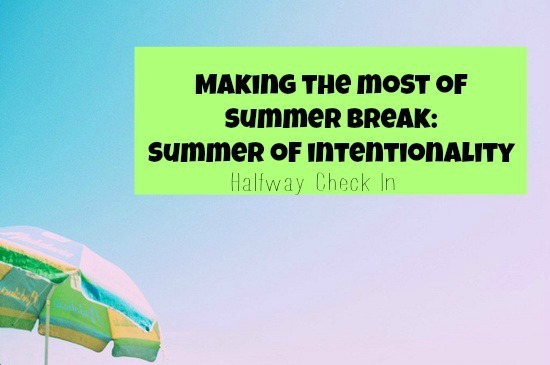 This entry was posted in Life as a Mama, Life as a School Teacher, Life At Home + The Neighborhood, Life/Birthday List, Projects, Self-Care, Summer of Intentionality and tagged making the most of summer break, summer, summer intention, Summer of Intentionality, summer plans, summer vacation, to do, to do lists, to learn, to read by Teacher Goes Back to School. Bookmark the permalink. Just updated my list today! I love lists. I mean, I LOVE lists.This has been an extremely productive and fulfilling summer vacay! Figure out flooring- decided to live with the ugly carpets, getting them cleaned tomorrow! master binder for social studies- maybe? Read the common core books I bought- tomorrow as the carpets are being cleaned!